It doesn’t show the whole tree, but you get the idea. Yorktown, Virginia, 2010. OK, for those of you who don’t already know it, I confess that our Christmas tree is WAY, way overdone. I always insisted on a live one until the ever-increasing quantity of my ornament collection got to the point where it would kill even the biggest, thickest “real” tree. In 2000, we got our first and only artificial tree, and it’s a dandy. Though it loses a ton of needles every time we put it up and take it down (and I thought it was only live trees that did that! ), it’s still thicker than anything I’ve seen in any store recently. Our tree is my personal scrapbook, so lots of things that aren’t really meant to be ornaments end up getting transformed into something I can hang on the tree. Since I put about 4000 colored lights on it, and some more conventional baubles as well, the oddball artifacts somehow blend into the scene without creating too much disturbance, at least not to us. The real drawback to our tree is how much time it takes me to finish decorating it each year. Or maybe it’s not a drawback at all. Maybe that’s actually a strong point. Once I finish wrestling with those branches that get bent out of shape sitting in the box all year long, and put 40 strings of lights and a star on it, the fun part starts. Hanging the ornaments can be very relaxing, even with a tall ladder, as long as I don’t rush myself. While decorating I listen to Jeff and Matt reading, or have an audiobook on, or play Christmas music. I take it a little at a time and usually don’t totally finish up until just before Christmas (or Thanksgiving, if we are hosting company for a big party that weekend). Daddy always started with the star. Taking the tree down is almost — but not quite — as time-consuming as putting it up, and is a lot less fun. So each year, I tell myself that perhaps this will be the last year I undertake this rather ambitious task. Not to worry, though…the torch is passed to a new generation! 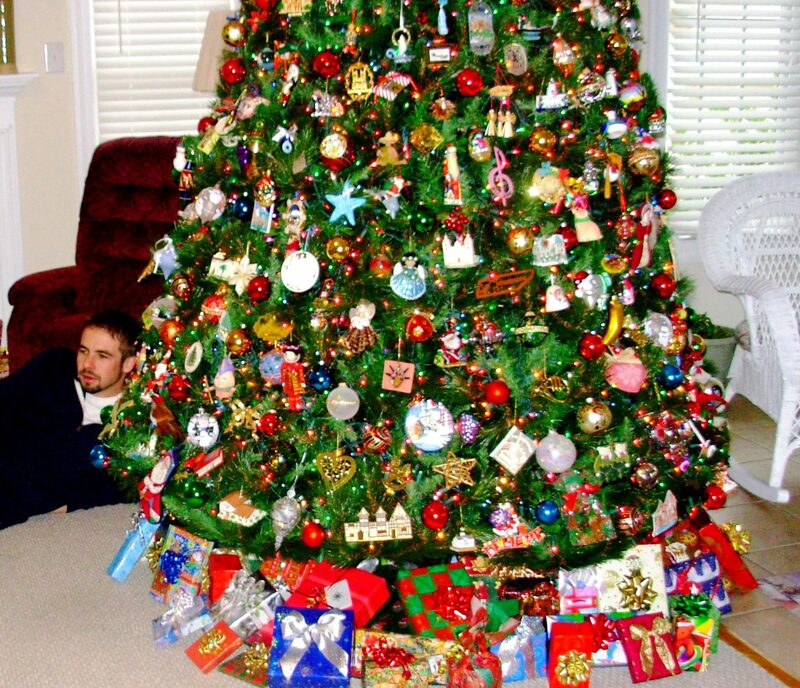 Do you have a Christmas tree or any other special traditions? What decorations, games and treats do you love best? Tell us about them and we might get some ideas for our own celebrations. And while you’re at it, if you need any ornaments, let me know what kind you like best, and I’ll send you one from our personal collection. Whether you deck your own halls or celebrate Christmas mostly in your heart (or not at all), I wish you a December full of memories to treasure for a lifetime. Janice, I was just writing a Christmas card to you last night (it’s all sealed up and will go out in today’s mail) and thinking of you, how much we miss you, how much you and I had been through together in the years we have known you. I would truly LOVE to send you one of my ornaments! What kind do you like best? I remember how beautiful your home always was at Christmas (and still is, I’m sure), and I treasure the memory of hearing Ben play his baby grand piano for us all when you hosted us there. I think I tucked a short newsletter-style update in the card, but maybe we should have a phone conversation (or longer letter exchange) to catch up on all the sorts of little details I would be telling you if we were together. As a holiday treat, here’s a mini-visit from the Ghost of Christmas Past, a snapshot of you and me in Tammy’s kitchen. Hope your holiday season is wonderful for you and all your family! ornaments from children all the way to fancy ones. It is a memory tree. I would like anything that you choose. If there happens to be a story behind it, please let me know. Janice, before you wrote this, I had picked out one to send you that does have a sort of story behind it. Part history and part essay, and of course you know I will give you more details than you want or need, hee-hee. Your tree sounds a lot like ours. Drew and Megan and Grady will get here on Christmas Eve and will be the first to stay in Matt’s new apartment (which we built on/in the detached garage). It’s not quite finished yet, but it should be better than camping! Gloria is coming too. Denbigh is hosting the PORT shelter this week; I wish we could be working there. This is the first time to host at our building. We will be hosting for an entire week, with other churches helping out as usual. Sending you our love and best wishes for a wonderful holiday! Julia, I don’t know if my reply went through to you. I am not very savvy with the computer. Janice, the first comment you sent did get through; for some reason I didn’t see this one til now, I think it was on a second page I didn’t catch. Hopefully you will be getting your ornament very soon. Hope your Christmas was a merry one — Happy New Year! Julia, I have been thinking of ya’ll for a while now. I am so thankful for your blog. It has helped me endure so much. Our well pump went out Saturday so I am without water. This is upsetting to Ron because it upsets his routine. Keep us both in your prsyers for patience. I hope it will be repaired this week. I would love an ornament. I love blue glass of any kind. MERRY CHRISTMAS!!! Oh, my, what timing! I can understand why that would upset Ron; that’s the sort of thing that Jeff gets upset about too, and when things like that go wrong, he can’t rest until they are fixed. I hope you have your pump back soon. I just sent up a prayer for patience for you, Ron and ALL of us (meaning the entire planet Earth) because patience can be in such short supply at this time of year. Based on your described preference, I already have an ornament in mind to send you. But I’m not sure I have your current address — can you email that to me? It still probably won’t get to you before Christmas, but maybe it will get there before you take your decorations down! 😀 Merry Christmas to you and your loved ones! Carolyn, I’m glad I’m not the only one who thinks Christmas seasons are getting closer and closer together. When I was a kid it seemed like forever; of course, it didn’t get started quite as early in those days. You have inspired me by saying that you will put up a tree as long as possible. Maybe I should have that spirit. How sweet of you to give your grandkids a head start at Christmas! That will be a big help when they go to set up their first tree. I can remember our very first Christmas tree in 1980 — I had not realized until then that it’s pretty expensive to decorate a tree if one is starting from scratch. We had NO money (and bought a very spindly cedar tree for $3.00 which my friend Alex called “a Christmas Weed!” I had a small ornament collection already, and Eric and Sherry gave us a string of lights. It was much better than nothing, though. From there, the rest is history! I too am hoping and praying for that five-year survival celebration. Merry Christmas to all the Miller family! That’s funny, our first “tree” was/were the branches my mother cut off the bottom of her tree, stuck in a vase of water. I decorated with 3 or 4 ornaments we bought at Gemco during one epic shopping trip. Another time, Johnny cut the top off en evergreen in our yard. Nowadays, we alternate between a live and an artificial tree each year and I’ll need to get a new fake for next year. Our ornaments are all memories now: gifts, travel souvenirs, items made by the kids, and even two from an ugly ornament gift exchange (they look like rawhide dog chews). My family decorated the tree for me while I was making Christmas Eve dinner, just like I’d hoped! Rene, I think your mother gave you an ingenious idea for a tree. In fact, that might be an approach I take sometime in the future. WOW, having someone else decorate the tree feels like a fantasy from an alternate universe for me. I’m so picky I’ve always preferred to do it myself, but as I get older and more worn out, the perfectionist tendencies in me are giving way to reality — which is a welcome development; I wish I had started moving in that direction long ago. Like 50 years ago! 😀 I like your idea of alternating between a real and a fake tree. I’m also mulling over different ways to enjoy my special ornaments year round, a few at a time, but not sure whether I want to do this, since it’s special to bring out all those memories at Christmas. The rawhide dog chew ornaments made me smile! I could give a lot of my ornaments away in an ugly ornament exchange, but to me they are all beautiful. Hope you have a great week! I think a Christmas Tree is a family’s key expression of the holiday. I have plenty of fond memories of our annual tree that was always real growing up in the Midwest, There was the fun of parakeets and house cats in there somewhere as wel, always managing to get in trouble. The bird just wanted to survive the cat. As an adult with a family we had two trees each year, one inside and the second on our all season patio with astroturf carpet and plenty of great lit decorations that could be seen driving down our road. We actually had a bird hatch baby robins in a nest it made in our outside tree one year. All these memories added to the fun. Bob, for us the tree was always the centerpiece too. It must have been great fun to have the parakeets and cats to keep things lively! Our friend Darla has both indoor and outdoor trees. The one outdoors is on her screen porch, and is covered with cardinal ornaments (the cardinal is Virginia’s state bird). I love driving past homes that decorate an outdoor tree. It’s really like a gift you gave to your neighbors and friends for the season. Having the robins would have made it all the more special. Thanks for sharing these lovely memories with us. I love the video of Grady trimming the tree. The close-ups showing Grady directing his mom as to exactly where the ornaments should be placed followed by a look at the whole tree showing the whole tree! What a wonderful family. Thank you Ann! Of course I think so, but I’m biased. 😀 We look forward to seeing Grady and his parents tomorrow! I’m so happy you enjoyed the video. What a pleasure it’s been reading through the comments following your post. I don’t think a tree is “too much”, as long as it makes you happy. I like the image of a tree as a scrapbook. Ours, too, is artificial, which allows us to set it up right after Thanksgiving and leave it up through the epiphany. I grew up taking the tree down on New Year’s Day, but Mike’s family kept it up through the sixth so I go with that. The boys enjoyed hanging ornaments when they were young, and could choose one every year. Some are from the Hallmark store, others from museums or trips. We have many hand-made ornaments from school and home as well, now faded but still part of the joy of the tree. I’ve kept a journal detailing what they chose each year and why. My hope is to pack them up and give them to them for their own first tree when the time seems right, along with the pages from the journal. These past few teenage years, when their interest has waned, I started order each of them an ornament from Shutterfly. I put a photo of them along with one of the cats or a special friend, then add their name and the year. I ordered one for Mike, too. Traditionally Mike sets up the tree and adds the lights. Then I take over with the ornaments. 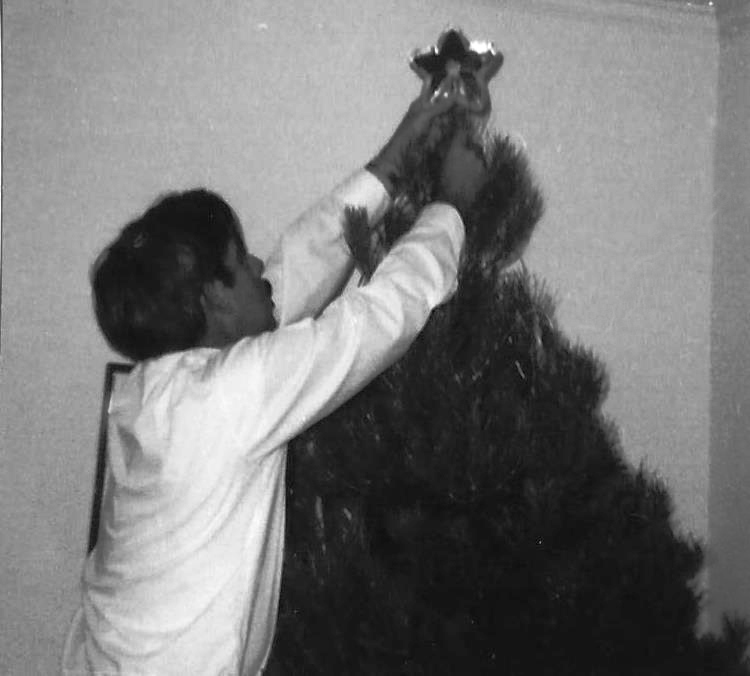 We have old super 8 footage of my dad adding the angel to the tree in Canada, probably 1965. Great post, Julia. Merry Christmas! Alys, how wonderful that you kept a journal for your sons about their ornaments. I kept a sort of inventory for years, telling where each ornament came from, but I finally gave it up as time seemed to grow shorter each year, and the number of ornaments grew. You are SO lucky that Mike does the tree and lights. That’s the part I dread each year. Have you considered having the Super 8 of your father digitized, or have you already done that? I finally got up the nerve to send out the old reel-to-reel tapes of Daddy reading Dickens’ Christmas Carol (previously I had been afraid of having them lost in the mail, but realized they are not doing us any good as they are, since there is no machine to play them). It was wonderful to hear it again this year. Merry Christmas to you and all your family! 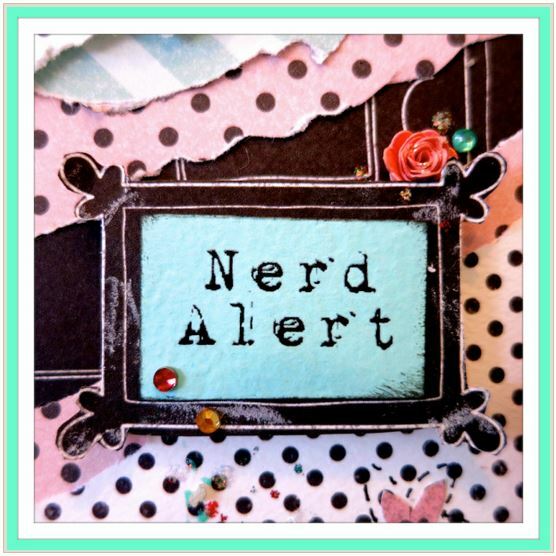 Hi Julia, This blog reminds me so much of my family. Since my birthday is 01 December, our tradition for years was to get a tree that day, and decorate together with Christmas music playing in the background. Without a doubt, my happiest of birthdays. I remember the stage when the kids would decorate what they could reach … and typically on some random localized cluster on one side of the tree! So I’m loving the Grady video! As my kids got older, they got better at it, but eventually lost interest. When the day came that I was not only the only person taking down decorations (on the 12th day of Christmas), but also the only one decorating, I switched to back-yard bonfires. Quite a shift, I know! Susan, I’m glad you were able to celebrate your birthday in such a memorable way. Was the shift to back-yard bonfires a tough one to make? I remember in 2012, right after Jeff’s diagnosis, we didn’t do a tree at all, but I didn’t miss it as much as I thought I would. Of course we were preoccupied and rather numb with shock, but I do remember it being so nice not to have to mess with the work of putting it up and taking it down. That year, we didn’t do any of our traditional holiday activities (except some Christmas cards), but the season was a time of peace and respite for us, quite lovely really. Maybe that should be our new normal. Still, I wonder whether I might tell myself “Not every year, but maybe sometimes.” Have you ever wanted to go back to having a tree at least every few years? Julia, isn’t it wonderful that we’ve become a “tradition” to each other? I’m so thankful for you, your family, your kindness, your inspiration and your special friendship. 🎄 For at least 30 years, I’ve had a beautiful handmade “Smoking Santa” by our Christmas tree, a gift from a very artistic friend. His little pipe, when incense cone was lit, would smoke and be such a treat to all. I gave it to Ashley and family last year to enjoy by their tree, in their home. And I miss it just a little, then think of what it means to them… It will always be “Mimi’s Smoking Santa”! 🎅🏻 Your tree is so beautiful, you must enjoy just stepping back to admire it! I love the photo of your Daddy, too. Thank you again for the package. 🎁🎁🎁🎁ANTICIPATION! Merry Christmas! Sheila, I have to confess — I didn’t wait for Grady after all!!! When Gloria got in this afternoon, we broke open BOTH TINS of cookies!! They are so delicious. The new flavor is great. Not too sweet, just right. You won’t believe this, but I have a smoking Santa too! I got it in Germany in 2005, when we went to visit Amy and her family. I saw several of them in a shop, and when Amy explained to me what it was and how it worked, I just HAD to get one! I don’t use it as much as I should, though. I have some incense that is supposed to smell like a real wood-burning fireplace (I got it when we moved to a home that had only a gas one). I should bring old Santa out and let him scent our fireplace here. Thanks so much for your kind words and friendship. I too am deeply grateful for YOU! I hope you all have a Merry Christmas — and after all the festivities are over, the dishes washed and the wrapping paper recycled, join me at Club Verandah for some hot cocoa by the fireplace– or maybe I should say iced tea on the deck, since it’s supposed to get to 80 degrees here on Christmas! Wow, I don’t wish for ice and snow, but 80 is a bit much! These eternal truths are borne out for us in Alcoholics Anonymous. About those lights…I learned something this year: they create a lot of HEAT, which I never noticed because it’s usually chilly. This year, it got up to 85 degrees for Christmas and I kept turning the tree OFF because every time I walked past it, I could feel it making the room hotter. Almost like a space heater that radiated heat without a fan. Hmmm, I’d better check the long term forecast before I decorate another tree. I SO envy your easy post-Christmas clean up this year. But I will take it slowly on the packing up, and listen to some great books on tape while I’m winding the lights and stashing the trinkets. It’s a labor of love for sure, but as with cooking, sewing, hostess duties and other such fun things, the need for it wanes over the years and it begins to seem less practical. Or maybe that’s just my old age kicking in and saying I’m too tired for it now. Maybe my tree should become a biannual or even every-five-year event. But I’m glad I did it this year. Thank you Sheila. I loved the mental image of you sitting by your tree at first light. I’m grateful to you for so many things, but most of all for being you! !